100 years ago today, though in our family we were reminded of the arbitrary nature of the 11thhour of the 11thday of the 11thmonth. My Welsh grandfather’s brother was killed by a sniper in Serbia on the 12thNovember 1918. The news hadn’t reached the other side. It always set me thinking about those who died in the month the armistice was being negotiated, or in the 48 hours between agreeing and signature. Karen’s mum’s cousin died on his first day in Burma in World War II. The commemoration over the week differed widely. 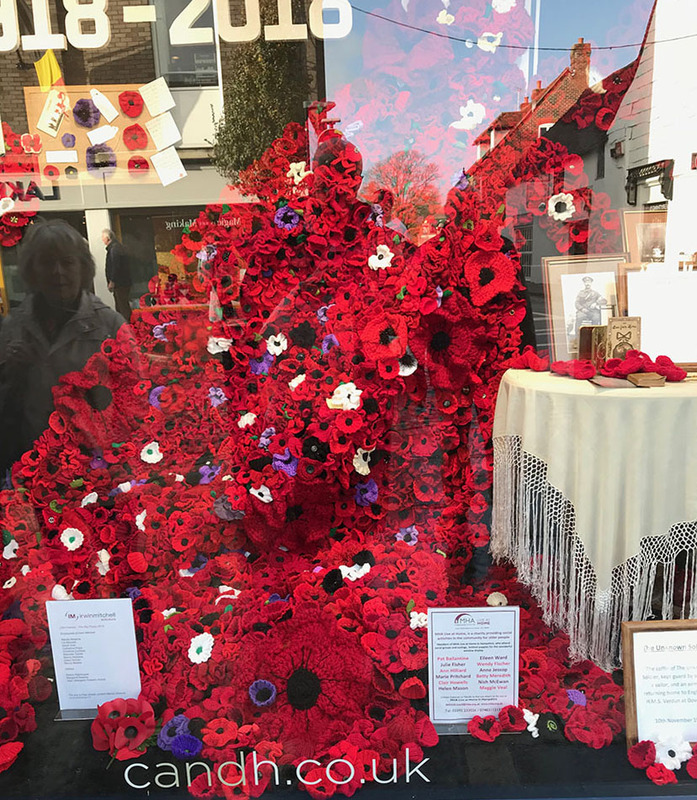 Not much sign of it in the big towns, but we spent Friday in rural North Dorset … Sherbourne, Stalbridge, Sturminster Marshall, and it seemed that every shop had an elaborate display with poppies, uniforms, flags, photos, shell cases, wooden crosses, original letters. The streets of those small Dorset towns were festooned with flags. Hand-knitted poppies were everywhere. I guess in those more rural communities you can walk past the War Memorial and see your family’s names engraved there. There’s a continuity that’s lacking in large towns and cities. Chichester’s not a small town, but there was a lot there on Saturday too. 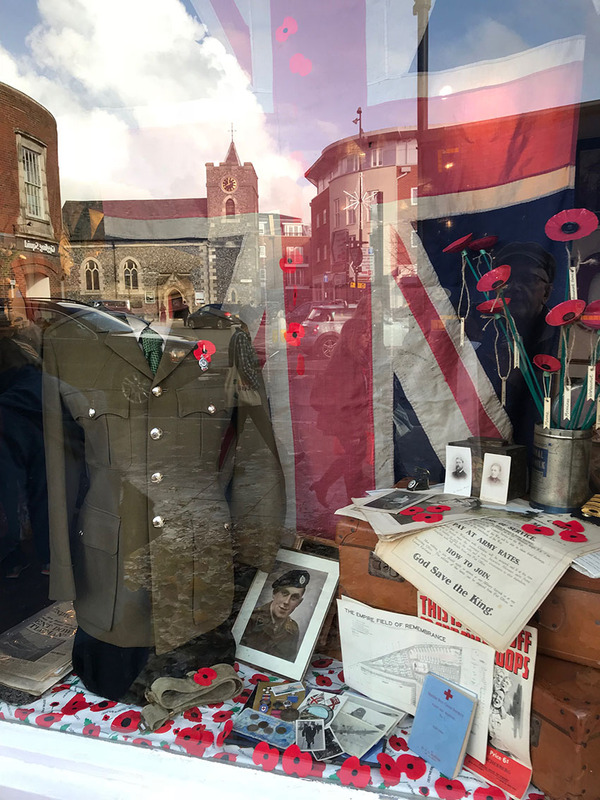 Window display, Chichester, Sussex 10.11.2018. Town reflected in the window. The 11 o’clock two minutes silence varies widely. A few years ago in Marlborough, the whole street stopped. Everyone came out of shops and stood in line in absolute silence, with the Mayor standing outside the town hall. Then one year, in Christchurch, Dorset, the priory bells rang, but half those in the street ignored it totally and just carried on walking and talking. It made me recall the National Anthem in cinemas, always played after a film when I was a youth. You’d try and nip out during the credits to avoid it. Once I was a bit slow, and was grabbed and ordered to stand still by two big blokes. One clipped me round the ear. Assault nowadays, but in the 60s, you just apologized and stood still. 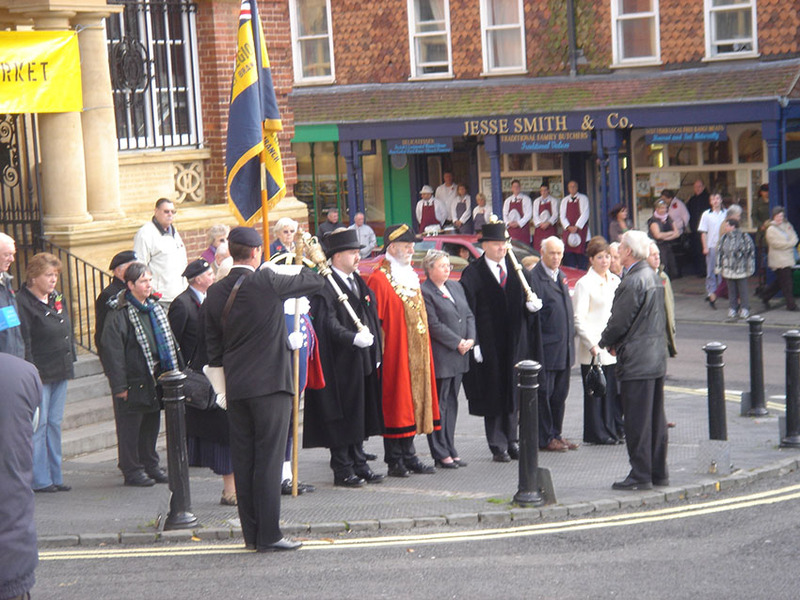 The response to Remembrance Day is partly military connection to towns. Another aspect is nationality, and I say this with trepidation, but a couple of years ago, we were in Waitrose supermarket. They announced it, closed the tills, the staff all stood. We stood stock still, me with my hat in hand. A Chinese family carried on talking at full volume, and so did some Russians. You do realize something’s happening when a hundred people are standing still and silently whether you understood the announcement or not. Or you really should. This Sunday morning we watched the Cenotaph ceremony on TV, and all three of us instinctively stood up for the silence. The Queen is there in her 90s, with her entire family, unlike a US President who called off his visit to the US military cemetery in France on the grounds that it was raining a bit. Try telling that to American soldiers in the trenches in 1918. Hey guys, this is the future you died for. At times in my life, I had a certain degree of ambiguity about Remembrance Day. We watched Saturday night at the Albert Hall yesterday – glorious music and colour and ceremony, and the poppies falling and drifting over the drumskins was magical, but the line can sometimes get too thin between commemorating the horror and sacrifice of war, and on glorification. I used to worry about that in the 1960s, when I was in the school cadet force and we had to march through the town with flags and bugles. I’ve got older. I remember my dad’s stories about the Normandy landings. He was with a radio unit in a flat bottomed landing craft off the beach for three days, while they reported. Ever after, he could feel sea sick just looking at a millpond calm sea. He recalled the bodies they passed, and told me the farmers were dragging off the German dead and chopping them up with spades to fertilise their fields. He wouldn’t touch French vegetables ever after! Today I remembered him bumping into a man from his platoon in the street, and how they greeted each other and how long they spoke. He was with the British radio trucks during Richard Dimbleby’s broadcast as they entered Belsen. He had nightmares about Belsen for the rest of his life. He died in 1966. The daft thing is, he missed England’s World Cup Final victory over Germany by days. It seems such a stupid regret, but he loved football and took me every Saturday as a kid, reserve games too. Also, when my (future) brother-in-law had a Volkswagen, my dad wouldn’t let him park it in our drive. Belsen. I must add that he had no problem at all with Germans as people, but because he had worked in the motor industry, he had work in 1946 relating to car factories, and could list which German industrial companies had profited from the war and which had slave labour or holocaust connections. I thought what it must have been like to leave a newborn baby (my older sister) and go away for five years, then come back as a stranger. He always said ‘My war ended in 1946. They didn’t send us home in May 1945.’ In my street, we had two generations. My sister’s “early war” peer group were all six or seven years older than my post-war baby boomer age group. There were very few kids in between. So in the two minute silence, my dad always is in my mind. World War II, not World War I. I think about 73 years of peace in Western Europe since 1945, fully aware that we’re lucky and what has happened elsewhere. 73 Years of peace. That’s why we were pleased and gratified to see the President of Germany at the Cenotaph today with the Prince of Wales. That is why I will never understand the momentum behind Brexit.